Golfers will be overjoyed with four nearby courses to choose from when they stay at Excellence Riviera Cancun in Riviera Maya, Mexico! Mayakoba Golf Club and Playa Mujeres Golf Club were designed by Australian golfer Greg Norman, while American pro Jack Nicklaus is the man behind Moon Palace Golf Club. Players might break a sweat on the course at Playacar Golf Club, but you’ll appreciate the challenge. If you’re feeling ambitious, check out all four and see which one you like best! 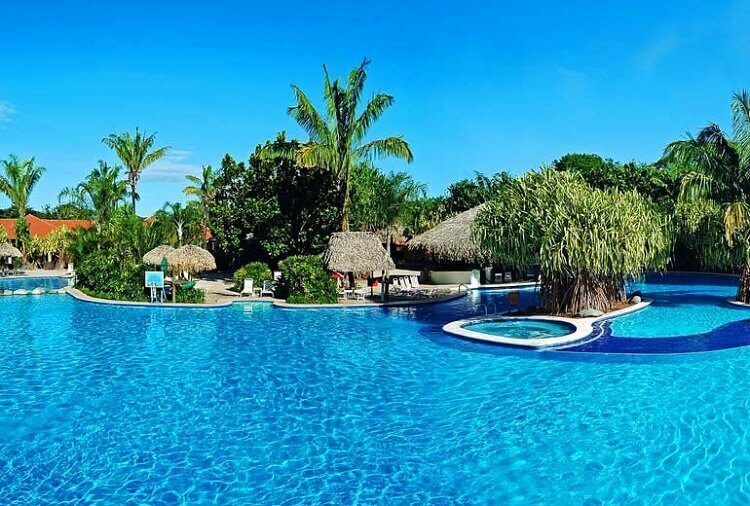 In between games, the resort’s adults-only atmosphere provides the perfect amount of luxury and excitement with six pools and five Jacuzzis, a secluded beach, 24-hour room service, watersports, and much more. Excellence Riviera Cancun has it all to keep you coming back! 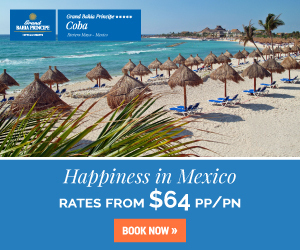 Book and SAVE on your vacation: Excellence Riviera Cancun packages are available at All Inclusive Outlet. Whether you know the ins and outs of golf or want to try it for the first time, you’ll be impressed by Sandals Golf & Country Club at Sandals Royal Plantation All-Butler Boutique Resort! 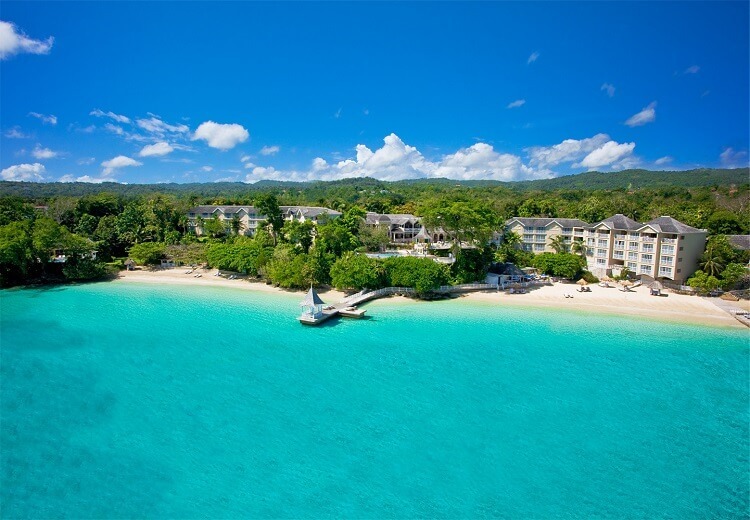 The stunning scenery of Ocho Rios, Jamaica alone will leave you amazed as you explore the grounds to find private lessons, a driving range, full-service golf shop, and more. The 18-hole course is well-kept so players enjoy a smooth game while taking in views of the Caribbean Sea! 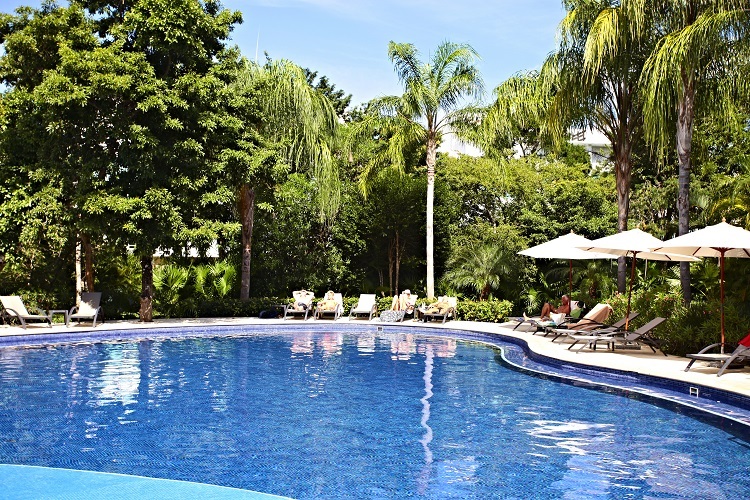 Follow up your round of golf with a visit to Red Lane Spa® or an invigorating dip in the resort’s swimming pool. The perfect end to a busy day in paradise is found in your spacious room with a view where you’ll be treated to personal butler service, a balcony, a fully stocked mini-bar, and more! Book and SAVE on your vacation: Sandals Royal Plantation All-Butler Boutique Resort packages are available at All Inclusive Outlet. Legendary golf course designer Pete Dye gave special care and attention to the three courses he brought to life at Casa de Campo Resort & Villas. Teeth of the Dog, Dye Fore, and The Links are all situated among the breathtaking landscape of the Dominican, making them the perfect courses for games as well as tournaments! Teeth of the Dog has even won a number of awards as one of the top golf courses in the world. Players will gain a one-of-a-kind experience as they participate in some of their best rounds yet! Beyond golf, Casa de Campo ensures the fun never stops, day or night! 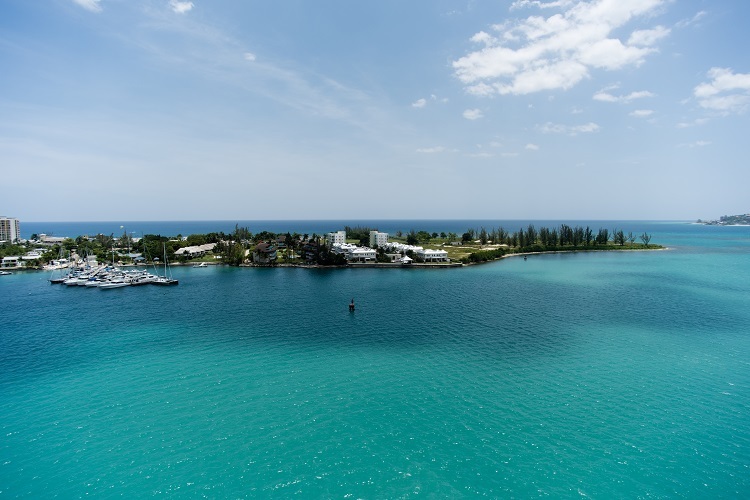 A vast marina, historic offsite excursions, a nightclub and movie theater, and dreamy beaches are just some of the many activities you’ll want to add to your to-do list. It’s always a good time! 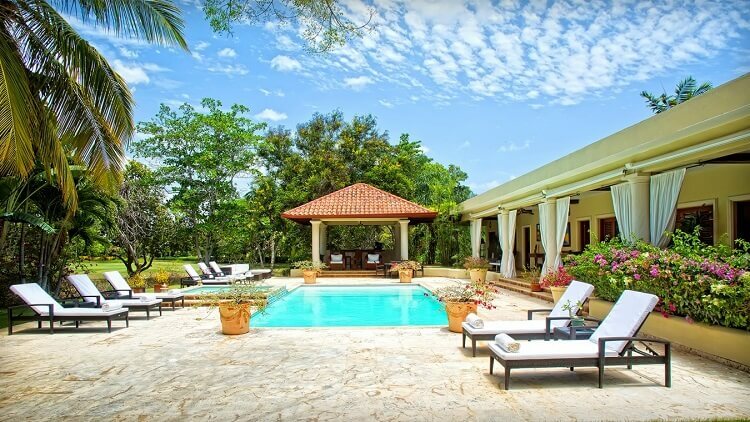 Book and SAVE on your vacation: Casa de Campo Resort & Villas packages are available at All Inclusive Outlet. A golfer’s dream awaits at Iberostar Cancun in Mexico! The onsite course designed by professional Japanese golfer Isao Aoki features 18 holes and is located between the Caribbean Sea and Nichupté Lagoon. As players make their way around the expansive greens, they’ll be immersed in swaying palm trees, bright blue skies, and a cool breeze coming off the water. To further enhance this wonderful experience, unlimited drinks and snacks are included, making every moment spent at Iberostar Cancun Golf Club unforgettable! Whenever you’re not on the course, soak up some rays on the beach, savor international cuisines like Japanese or Mexican, or witness a colorful live performance in the evenings. 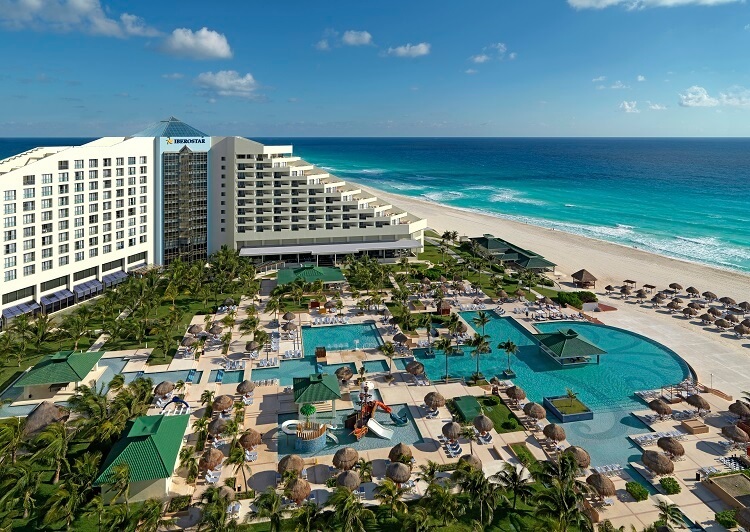 Your tropical vacation at Iberostar Cancun will be unlike any other! 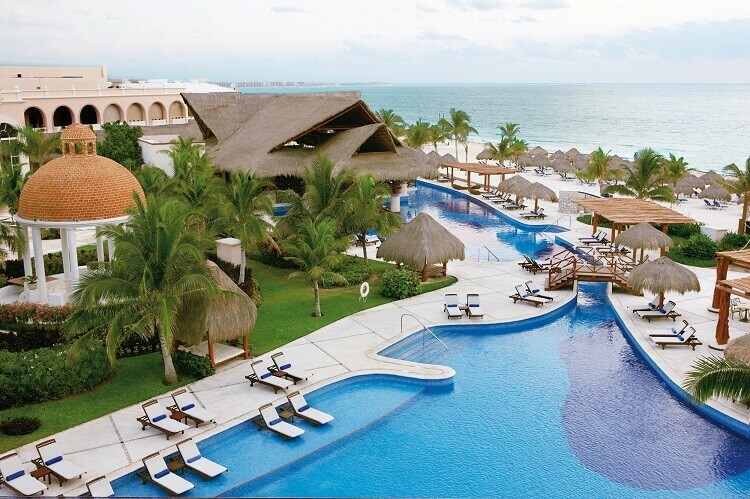 Book and SAVE on your vacation: Iberostar Cancun packages are available at All Inclusive Outlet. 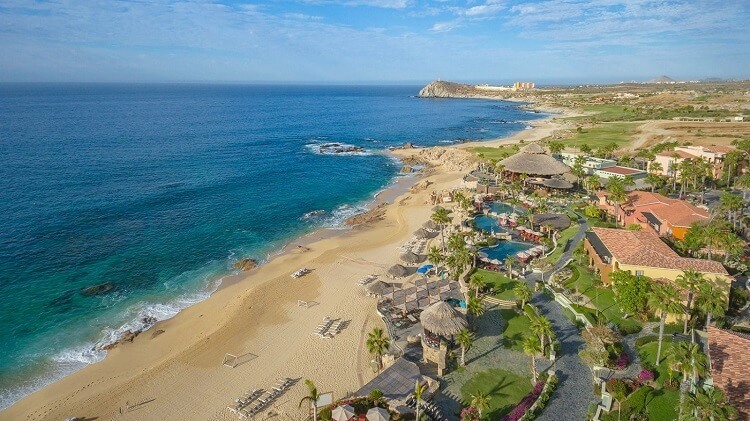 Get the best of both worlds during your golf vacation at Sheraton Hacienda del Mar Golf Resort & Spa in Cabo San Lucas! Ocean Course features breathtaking views of the coastline and beaches while Desert Course is set in desert-like landscape, but still carries your gaze to the water. Golfers will appreciate a clubhouse, restaurant, locker rooms, caddies, carts, and a driving range to make the most out of their time! In addition to golf, the resort has everything you need to create your perfect beach holiday! The pools offer swim-up bars or wait service for your convenience, and Cactus Spa takes your relaxation to a whole new level. Throw in meals, snacks, and drinks from any of eight different locations to top off your vacation! Book and SAVE on your vacation: Sheraton Hacienda del Mar Golf & Spa Resort packages are available at All Inclusive Outlet. 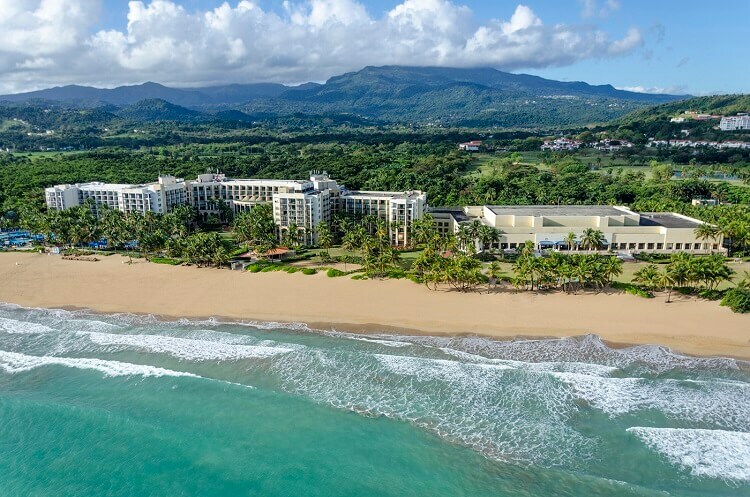 Grab your clubs and get ready for a thrilling golf getaway at Wyndham Grand Rio Mar Beach Resort & Spa in Puerto Rico! Choose between one of two nearby courses where you’ll test your skills, but still enjoy a riveting game. The Ocean Course, designed by Tom and George Fazio, and The River Course, designed by golf champion Greg Norman, maintain island vibes with towering mountains and the sound of ocean waves in the background. Don’t forget to visit the Rio Mar Clubhouse for a refreshing beverage or quick meal before you head back to the resort! Keep those island vibes alive at Wyndham Grand Rio Mar Beach Resort & Spa’s lagoon-style pools while lounging in a private cabana. Nature walks and bird watching, the casino, lush accommodations, unique dining, and plenty more will guarantee your time in Puerto Rico is well-spent! 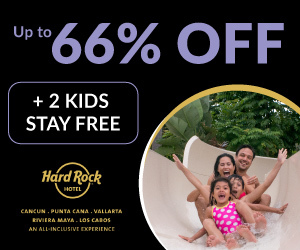 Book and SAVE on your vacation: Wyndham Grand Rio Mar Beach Resort & Spa packages are available at All Inclusive Outlet. The vibrant greens of Reserva Conchal Golf Course at Westin Playa Conchal in Costa Rica were carefully thought out by Robert Trent Jones Jr. Guests will be exposed to exotic natural scenery and beauty while perusing the 18 holes strewn about the course. A driving range and lessons are also available for beginners or those looking to warm up before they tee off! After spending time out on the golf course, Heavenly Spa by Westin™ has everything you’ll need to unwind and cool off. They even have a golfer’s massage to help restore your muscles and ease any tension. A quick dip in the free-form pool followed by a hearty meal bursting with flavor add to your perfect day in paradise! Book and SAVE on your vacation: Westin Playa Conchal packages are available at All Inclusive Outlet. Golfers of all levels are invited to enjoy complementary greens fees at Cocotal Golf Course during their stay at Paradisus Punta Cana Resort! The Jose Gancedo-designed course features 18 holes, but you always have the option of doing just 9 if you’re not up for a full round. The professional staff will attend to any of your needs while pitching and putting greens, a driving range, and golf carts are available for your convenience! Along with golf, a number of sports, shows, classes, and entertainment are offered at Paradisus Punta Cana Resort! Take a salsa lesson, practice yoga, or attend a Latin-themed party. Allow time to disconnect and soak in your surroundings out on the private balcony or terrace back in your room. We promise it will be hard to leave this beautiful resort behind! 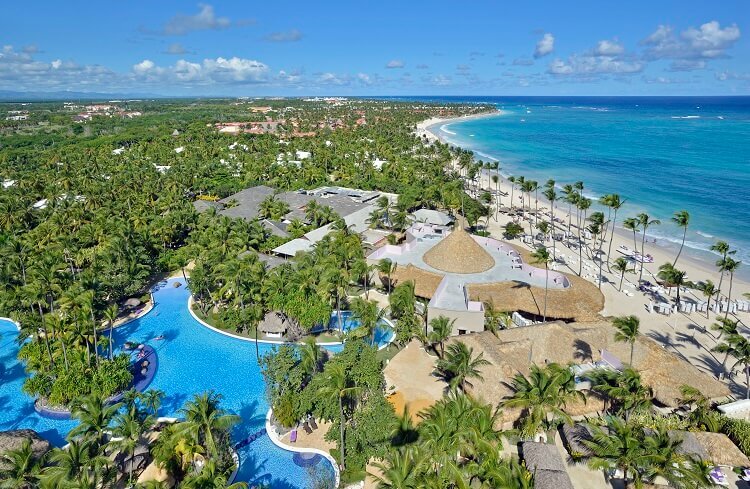 Book and SAVE on your vacation: Paradisus Punta Cana Resort packages are available at All Inclusive Outlet. During your stay at Dreams Villamagna in Puerto Vallarta, Mexico, you can take your pick from two different golf clubs! Vista Vallarta Club de Golf offers a course designed by Jack Nicklaus where players will be blown away by the beauty of Puerto Vallarta and Banderas Bay. The second course, designed by Tom Weiskopf, provides more opportunity to awe at the natural settings as you strive to meet par. Over at Marina Vallarta Golf Club, take in more views of Banderas Bay among a beautifully manicured course designed by architect Joe Finger! Dreams Villamagna understands the desire to sit back and relax during those moments you’re not showing off your golf skills! 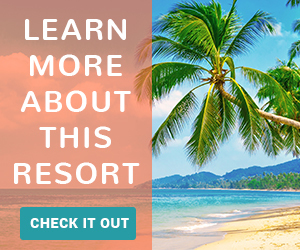 The resort’s Unlimited-Luxury® experience sends you headfirst into lavish accommodations, gourmet dining, endless premium beverages, wait service at the pool and on the beach, and so much more. You’ll truly be living the dream! 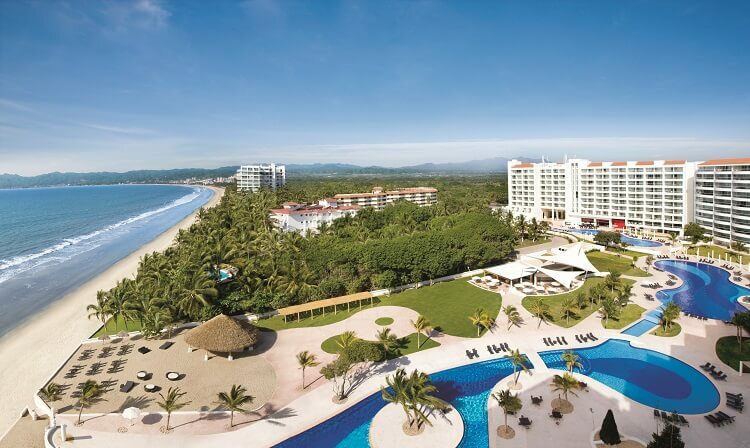 Book and SAVE on your vacation: Dreams Villamagna Nuevo Vallarta packages are available at All Inclusive Outlet. Your Caribbean vacation at the adults-only Beach House Turks and Caicos won’t be complete until you’ve played at Provo Golf Club! Golf aficionados have access to meals at Fairways Grill, a pro shop, practice areas, and group and private lessons led by trained professionals. Plus, Karl Litten’s flawless course is the optimal place for competitive rounds or leisurely games against vivid tropical backdrops! Beach House Turks and Caicos welcomes guests to indulge in fabulous amenities like water trampolines, reserved beach chairs and umbrellas, a 24-hour gym, and access to sister properties Blue Haven Resort and Alexandra Resort, to name a few! After a delightful meal and down time in your airy, tranquil suite, you’ll know you hit the jackpot! 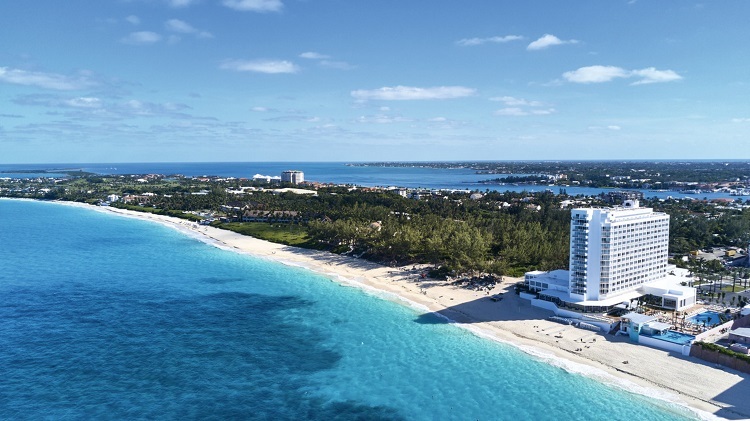 Book and SAVE on your vacation: Beach House Turks and Caicos packages are available at All Inclusive Outlet. Take your golf game to new heights in areas you won’t just find anywhere! We guarantee it will be unlike anything you’ve experienced before. Visit All Inclusive Outlet now and peruse through the best discounted vacation packages so you can discover what these golf resorts are all about!